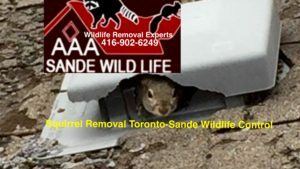 Squirrel removal Toronto should be left to the specialists at AAA Sande Wildlife Control. “GTA’S WILDLIFE EVICTION SPECIALISTS”. Squirrel removal toronto services are in high demand. It is an understandable fact humans cannot coexist in one space. Sharing your home with a Squirrel has unpleasant consequence. Squirrel damages to your home are costly, which makes Squirrel removal Toronto services very much needed. Many of us are aware and wary of the human intrusions to wildlife, and it is one of the most debated topics among environmentalists. Squirrel removal Toronto services see the scenario of the intervention seems contrary. As reported, many commercial and residential areas are affected by wildlife encroachments. Some species get accustomed to living on premises with us. The intrusion will become very annoying as well as very costly for us human beings to deal with. To be more precise, wildlife species such as Squirrels, Raccoons, Skunks, Bats, Birds and small rodents will cause themselves to be a nuisance. The disturbances they render to our lives as human beings is in no means good. The health hazards, the sleepless nights as well as along with property damages make them pests. Getting rid of such commotion is important to all of us. But the matter of wildlife control must be tackled with an ecological-friendly course of action. Wildlife should be dealt with Humanely to prevent further damage to ones property. Wildlife control firms specialise in prevention and removal of Wildlife. To resolve Wildlife issues is to know the Wildlife and their habits. Wildlife on residential and commercial properties are no doubt a issue in Toronto. It is important to seek a professional service that can help in taking the required measures for effective Wildlife control. Whether you want the save your new laid out lawn from being destroyed by a Raccoon. Want to get rid of a Skunk from playing havoc with the senses of your nose. Seek to get a Squirrel out of your attic cause it’s driving you crazy. Sande Wildlife Control may seem the most legit options, amongst all other so called humane Wildlife control services. There are two levels at which Wildlife control or removal services work. Firstly, these services enable you to get rid of the troublesome wildlife; secondly, these services also can prevent the future instances of such encounters. One cannot wait for Wildlife to leave the living spaces on their own. Our Squirrel removal Toronto services gets them out overnight. Squirrels need to be removed in a way that they don’t re-enter the areas again. To accomplish this, residents would simply want to trap and take to a faraway place. But this won’t solve the problem for a long time. As it is said before, many Wildlife creatures find areas inhibited by the humans more amiable and adaptable to live. That is why the urban environment is mostly affected by the wildlife encroachments. Safe and ecologically friendly methods need to be adopted to remove the Wildlife in residential areas. If this problem isn’t tackled professionally, one can expect their home in jeopardy. And this can be a recurring problem throughout this human and wildlife interaction. What do Wildlife removal services do? Wildlife removal services ensure that you don’t have to face this intrusion again. The process to remove Squirrels from your roof can be done in a short period of time. Even with Raccoons in a roof can be removed very quickly. A professional Wildlife control technician should know home construction and Wildlife habits. Proper investigation of every situation is needed for effective Wildlife control. Wildlife need to be removed but also the repairs needed to secure your house from future invasion. This is the most basic thing that you can expect our services for squirrel removal Toronto. Be it Raccoons, Skunks, Opossums or Bats, they need to be handled safely so that there is no violation of protection rights for any of the parties. The Squirrel removal process is not just a haphazard method where any or everything is used to get hold of or rid of these wild animals; rather it is more of a systematic approach where proper wildlife control procedures are in place to safely remove adult and adolescent wildlife. After we determine the wildlife and situation we are to provide to our customer, our excursion team safely provides a quick and effective solution to your wildlife removal issue. 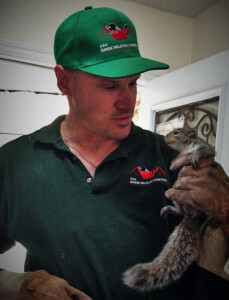 Our team of professional squirrel removal Toronto technicians are able to provide our public with poison free solutions. A pest control service is out to poison to solve your wildlife problem and this can be a very smelly situation for you to chose. Wildlife removal services should only use none poisonous methods to remove nuisance wildlife. Removal of any adult wildlife almost anyone can do, however, the use of poison will either leave a dead adult animal dead in your living space or its young to slowly die and smell. Our process doesn’t end with one-time wildlife removal as it is important to banish their further intrusion into the houses or offices where they have sought refuge. As wildlife are also products of their habits, so they would want to come back to the place where they had been seeking shelter or to give birth to young. So you surely wouldn’t want that to happen again after being disturbed the first time. So our experts make sure that the future entry points and structures are sealed off effectively. 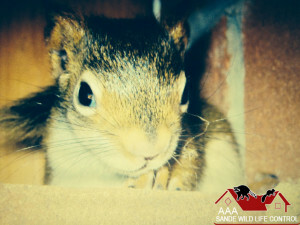 Our wildlife removal and Squirrel removal Toronto services also address the concerns regarding the repairs of the damages resulting from such wildlife encroachments. These include such areas as damaged roof vents, electrical wiring, damaged soffit sections, holes torn into the roof, damaged shingles, plugged up and chewed up side vents, ripped apart plumber mats and many other sections that wildlife chose to gain entry to nest. The repairs we make are everlasting to the life of your roof; we make sure to provide you a written guarantee of such wildlife not to enter back in again from whence they have. Squirrel easily chewed through this plastic roof vent to gain access to the attic and have her babies inside. 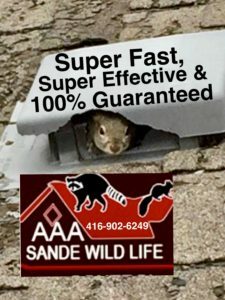 Once the Squirrel removal Toronto service is completed the damaged roof vent is replaced and secured from future entry. Owner Of Sande Wildlife Control-“GTA’S WILDLIFE EVICTION SPECIALISTS”. 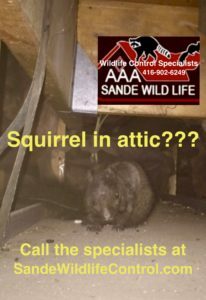 Our Wildlife and Squirrel removal Toronto services are greatly appreciated throughout the GTA, York, Durham, Peel and Caledon regions. We have been able to maintain a very high rate of customer satisfaction through out our quality services and this is pretty evident from the tons of reviews that are posted on Google and Homestars sites regarding our services. The majority of the customers have been satisfied with our services and find them to be exceptional.